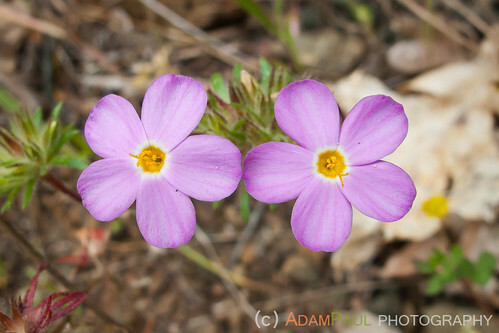 Sarah & I spent Memorial Day with her cousin and his lovely family near the little town of Willits in Northern California, and I was surprised to see a great many wildflowers still in bloom as we walked around their property. There was Linanthus galore, its delicate yellow filament a dead giveaway. 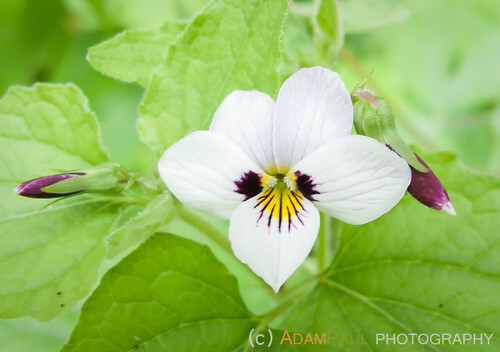 A few patches of Western Heart’s-ease Violets bloomed in shadier areas. 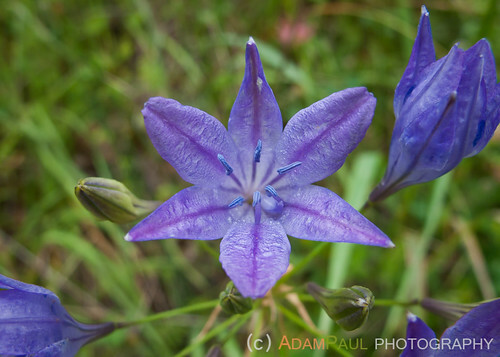 These are easy to ID if you just look at the backside of the top two petals – they’re purple in this species. 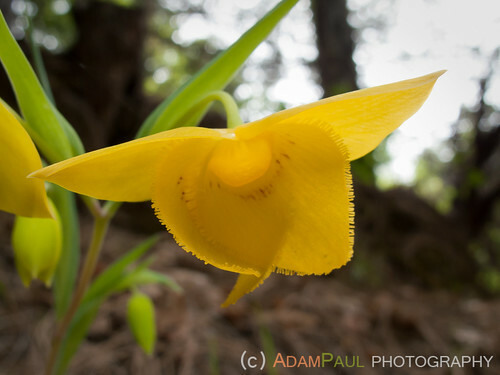 The west-facing hillsides were covered with more Yellow Globe Lilies than I’ve ever seen. They mostly stymied my attempts to photograph them, as Globe Lilies usually do. 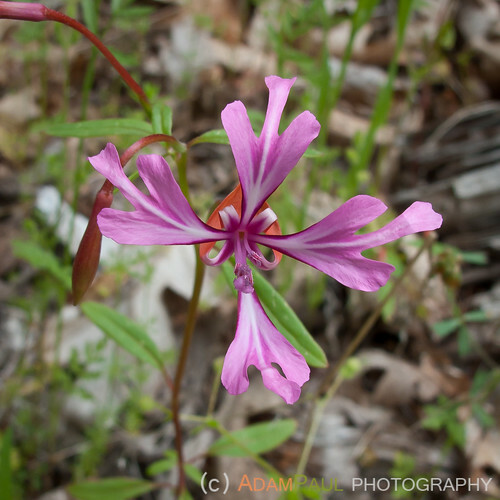 A wild flash of pink caught my eye – something new! 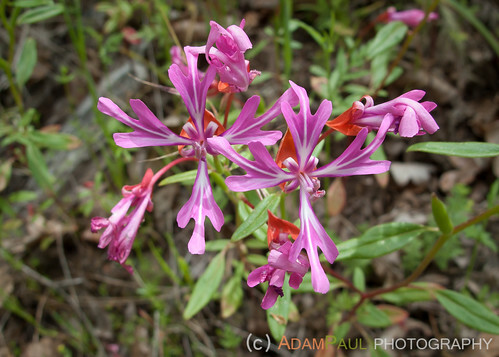 I initially thought it was Elegant Clarkia, but a lookup in my books back at home shows it to (probably) be Redribbons (same genus, but different petal shape). Clusters of purple Ithuriel’s Spear were plentiful, although we didn’t see a single one of its close cousin, Elegant Brodiaea, which is usually present along with it. 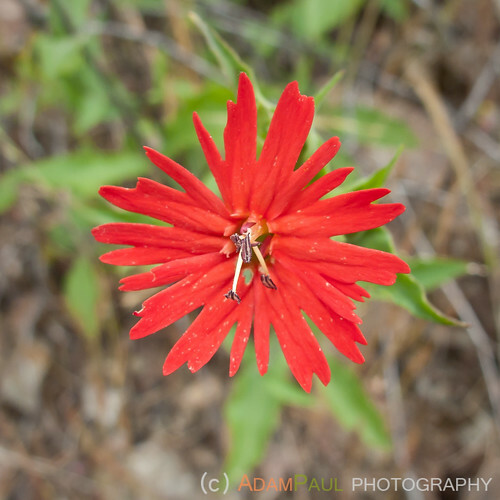 Another bright flash, inconveniently-located high on a hillside – Indian Pink, an unusual flower that I’ve seen only once before. 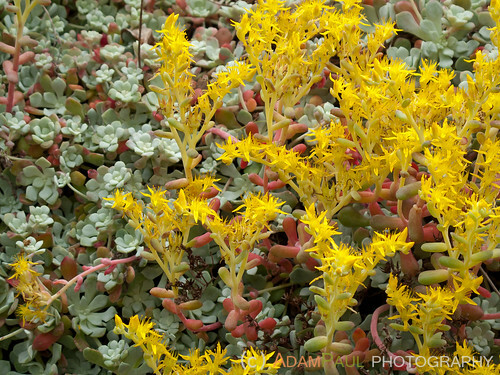 A rocky outcrop was almost completely covered in Dudleya, most of it blooming. 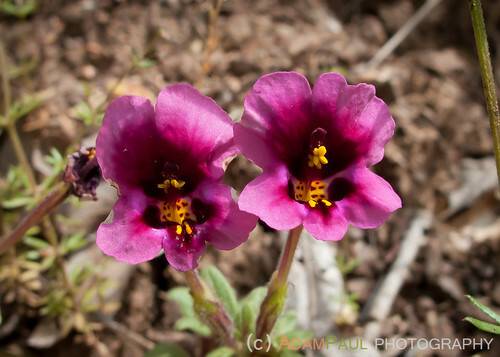 The un-subtle flaming magenta of Kellogg’s Monkeyflower also caught my eye – another flower I’ve only rarely seen. Unknown flower – what is this? Down by the river, several clumps of the white flower above were blooming, but I’m afraid I have no name for it. It almost looks like a checkerbloom. 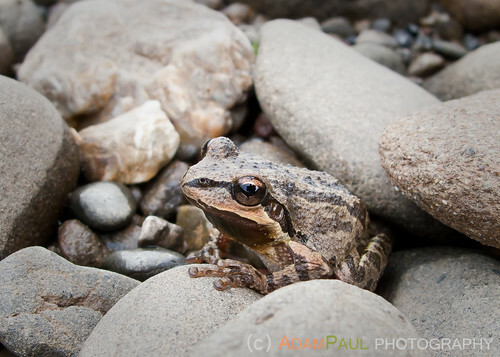 As we admired the huge numbers of tadpoles in the river, Sarah spotted their source nearby – cute little fellow, huh? Blending in so well as to nearly be stepped on, this little frog cooperated pretty well for close-ups, unlike its green neighbor. For a lazy 30-minute stroll on the cousin’s property, I was pretty impressed with the variety of flowers still in bloom in late May! 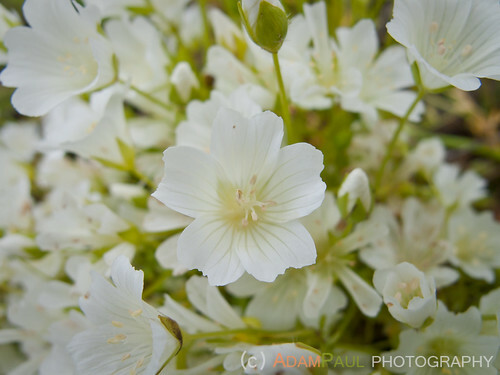 The white flower looks like a meadowfoam – Limnanthes sp. 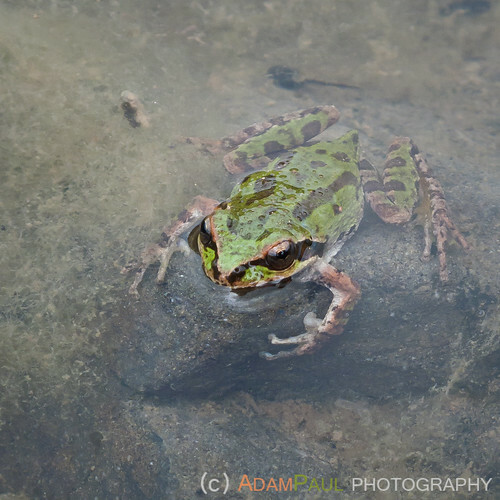 You see them alot in wetlands and vernal pools. Where in Willits was this (general area, road…)? I grew up there and now live in Windsor (just north of Santa Rosa). Never noticed all of these flowers when I was a kid. Your photos are great. What camera/lens do you use? I have a Nikon d40 and use the nikon closeup diopters (3t & 4t) on a 55-200. Would like to have the 200mm macro, but get decent shots with the cheap setup! Thanks, Steve – someone on Flickr also said it was a meadowfoam. This was near the intersection of Hearst Willits & Tomke roads, a little ways east of Willits itself. In this post, everything was taken with a Canon G10 – since we were just up visiting family, I didn’t want to lug my SLR & macro lens around, although had I known the flowers were going to be so good, I might have! I usually use a Canon 30D & Canon 100mm f/2.8 macro for close-ups, but the G10 does a fine job, if you can get it to focus – it’s a little fiddly in mediocre light, but at least it has MF, unlike most digicams. You couldn’t ask for a better flower shot, it is almost like a perfect mirror image of perfection!